Free Shipping Included! 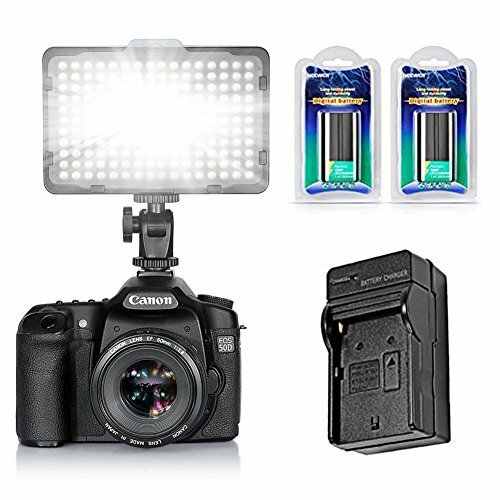 Neewer 176 LED Video Light Kit for Photo Studio Shooting,Includes:(1)On-Camera Video Light,(2)NP-F550 Replacement Li-ion Battery,(1)Charger with Car Adapter for Canon,Nikon,Sony and Other DSLR Cameras by Neewer at Kmpacting Studio. MPN: 4332005825. Hurry! Limited time offer. Offer valid only while supplies last. (1)176 LED Video Light: 176 highlight LED bulbs,provides wider lighting range and brighter effect for creative photography and videography. 176 highlight LED bulbs,provides wider lighting range and brighter effect for creative photography and videography. This kit includes:(1)176 LED Video Light+(2)7.4V 2600mAh Rechargeable Li-ion Battery+(1)AC Wall Charger and In-Car Adapter for Sony Camera TRV1/TRV3/200/300. (1)AC Wall Charger and In-Car Adapter:this is a new generic battery charger plus car adapter designed for Sony F550/F750/F960 and other compatible batteries.